Does Consistency Matter in Customer Relationship Building? - Brilliant Breakthroughs, Inc.
Home › Customers › Does Consistency Matter in Customer Relationship Building? Does Consistency Matter in Customer Relationship Building? Many ask “Does Consistency Matter?” We already know the answer, don’t we? Does consistency matter? Yes, it does! It matters in most things in life and business. Small Business Owners try to convince themselves that it doesn’t matter, but it does. It does improve YOUR Success Rate. Consistency is a respect and/or commitment thing. How are you showing up for yourself and others? This is an important topic to me right now because I haven’t been as consistent with supplying you with great blogposts as frequently as I have in the past. This has bothered me for months. Let me explain what has happened over the past 7+years of blogging and you can tell me if consistency matters. In May 2011, I started this blog. In 2009 I blogged weekly for a year. Then took a year off before starting this one. Hard to believe when I started studying blogging in 2008 it was still the Wild West! There wasn’t any standardization, and SEO didn’t exist like now. For the first 6 months I evolved from one to two, and eventually 3 blogposts/week. Why? Back then, google really boosted you if you had 3 blogposts/week. Why blogging? It was a great way to get content into the marketplace – essentially for free. Additionally, since blogged content first publishes on my site, I owned all intellectual property rights for anything*. I was being a good steward to my business. For 6+ years I published a business training blogpost 3 times/week. Around 850 blogposts published here and I hit burn-out. This was a year ago. Even though I was drained, I pushed myself to stick with the 3 publishings a week until I hit my 900th blogpost milestone. I decided that was when I would drop down to 2/week. Guess what happened? I was still in burn-out of creating valuable content. No matter how hard I tried, nor how bad I felt, I haven’t been able to stay consistent with posting twice/week. I’ve missed about 4 weeks of having 2 posts published for you. I was living The Law of Diminishing Returns. Clearly my muse isn’t showing up like she once did. Will I abandon my blog? NO, not at all! Let me explain why. Blogging is still the best way to get content out to YOUR Marketplace AND it’s the most economical. Also, you can re-purpose each of your blogposts into other forms of content (since everything starts with a script), it’s a no-brainer to continue blogging! Consistency matters because I turned you on to some really great information to help you simplify your business’s success. Just like when dating, it’s important to routinely show up for your probable or actual customer. It demonstrates they are important to you. More importantly, that’s why I’m posing this question to you now. I know I fell short 4 weeks this year to hit my twice a week commitment to you, my followers. Please forgive me from missing some. Now, some of you might be saying, but Maggie you wrote a #1 bestseller and have Volume 2 coming out in a couple months. Or maybe some of you are saying, “you’re membership site is super cool”, or “what you’re consistently serving up tips and tricks on your Business’s Facebook Page.” I ask you: Does any of that really matter? Not to me. Why? I’m turning on different followers on different channels. Regardless of which channel, if I start feeding my customers in one space (restaurant) and they’re waiting for me to serve up some awesomeness and I don’t appear. It really doesn’t matter to them that I’m baking up something super-delicious at the restaurant down the street. They came for me to serve them where I have been serving them. I see this happen too often on social media. You like/follow/friend someone and immediately they want to pivot you to another platform. Stop doing this now if you already are! If you are going to show up on a platform to attract business – consistently show up and serve your marketplace. If you’re not going to serve them there – don’t even try to attract them on that specific platform in the first place. Why? Our job is to consistently serve, not frustrate our probable and actual customers. 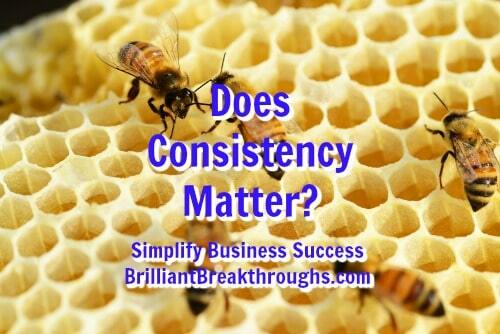 Why are we still asking, “Does consistency matter?” We all know the answer. What we don’t like is it means self-discipline! Remember: It will never change – consistency does matters. It’s only second to delivering high quality content. However, in business consistency is essential for you to own YOUR Marketplace. If you aren’t, I just shared how I did it. TIP: Make it easy on your probable and actual customers – show up where they want you to and then keep showing up there! What’s my decision? I don’t have an definitive answer yet, but 1 blogpost/week may be in my near future. Guess it’s a good thing I have small content doses I’m providing weekly to still consistently serve you on other platforms. *Intellectual Property Rights for anything as long as it is not plagiarized. How would your business change if you stepped into consistent relationship building? Feel free to share what’s going to give you great impact in the comment section. Copyright: Article is copyrighted by Brilliant Breakthroughs, Inc. The internet is about sharing. Please share this post in its entirety with full attribution to www.BrilliantBreakthroughs.com. Thank you.